Kathy Stoltz and Helen Gibbins represented the state League at a meeting that Secretary of State Natalie Tennant held with various organizations on February 11 to discuss ways to combat voter id legislation that is being introduced in the legislature. Her office is adamantly opposed to the legislation and released this press release the following day. The League of Women Voters of Morgantown-Monongalia County is sponsoring a Local Government Workshop on March 13 from 7 – 9 pm, at the Aull Center at 351 Spruce St. The Purpose of the workshop is to provide League members and other interested persons an opportunity to increase their awareness of how our local government works and to consider current issues relating to both City and County government. Some topics that will be discussed are, Home Rule, A Downtown for All, and the City Charter. Refreshments will be served. Thomas E. Lovejoy, a conservation biologist, presented a lecture on climate change in January at the West Virginia University College of Law. Lovejoy explored the past and present impacts of climate change on nature and biodiversity as well as how managing ecosystems could reduce the amount of climate change that will occur. In 2012, Lovejoy received the Blue Planet Prize for his lifetime in conservation. He developed the “debt-for-nature” swap program for environmental protection projects. It is one of the largest sources of financing for international conservation, resulting in more than $1 billion in funding since 1987. Lovejoy is an environmental science and policy professor at George Mason University. He founded the TV series NATURE on PBS, and was the first to use the term “biological diversity” in 1980. He holds B,S. and PhD degrees from Yale University. Visiting the capitol might seem a bit daunting at first, but I’ll be there along with other environmental lobbyists to help you navigate the halls to meet with your representatives. We must make them understand that we’re facing a life-changing scenario in our hills and hollows. And there’s nothing like a personal visit from constituents to put across the idea that current regulations for drilling are woefully inadequate. Call ahead and make an appointment with your representatives. This could avoid disappointment and wasted time. Email or Call Chuck at 877 252 0257 to make arrangements. Call Chuck’s cell phone at 304 545 6325 when you arrive at the capitol so we can hook up. To stay informed about Shale Gas legislation and related news, please ask Chuck to add you to his mailing list. Contact the Governor to include Medicaid Expansion in WV’s ACA reform!! Your Board would like you to be part of a calling/mailing/e-mailing to Governor Tomblin and encouraging him to ACCEPT MEDICAID EXPANSION AS PART OF THE AFFORDABLE CARE ACT IN WEST VIRGINIA. Medicaid expansion means putting 125,000-130,000 more WV low income people on Medicaid as their way of having health insurance under the ACA. If a family or individual earns 138% of the federal poverty level, or less, they may qualify. The Federal Government is going to support the expansion in the states with a high Federal matching rate for the new Medicaid recipients. They will pay 100% for 2014 through 2016, 95% in 2017, 94% in 2018, 93% in 2019, and 90% in 2020 and beyond. Current Federal matching rates for regular Medicaid and Chip are well below these rates. The states can choose not to include Medicaid expansion in their Healthcare reform. Governor Tomblin has been studying the costs before he decides. Please get in touch with him by phone, e-mail or mail. Use the points in the letter below as you see fit. Please include Medicaid Expansion as part of West Virginia’s Affordable Care Act reform. 1) Having healthy people will improve every aspect of life in West Virginia including the economy. 2) It will put large amounts of Federal money into our economy. 3) Our rural hospitals will have more support. 5) For lower income working people with uncertain job stability, this is the most efficient and cost effective way to insure their health. 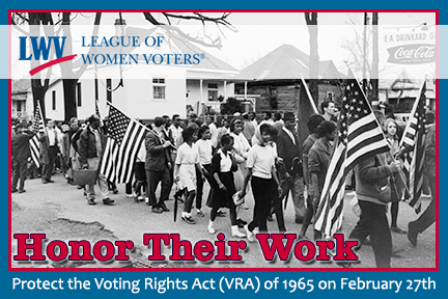 This edition of the Voter contains supporting statements for LWVWV’s legislative priorities. Take a bus to Forward on Climate! Read Jessica Jones of LWWUS blog post, Join the League for the Largest Climate Change Rally in History! Then purchase a $20 round-trip bus ticket at the WV Sierra Club Store. I heard the first bus sold out, so a second one has been charted. This is going to be a large rally!